Will be funded: No. This proposal needs additional 125 Yes votes to become funded. Over the last two months, the duration of our most recent proposal, we have continued to follow our holistic adoption strategy. We have launched Dash at 3 exchanges, 1 gift card fiat on-ramp, 84 merchants, 2 import business and on one of the biggest Africa focused hosting providers. Nigeria is now #5 on discoverdash.com. Furthermore we have run a very successful social media marketing campaign, an adoption conference and meetups where we directly connected our merchants and services with new users. Our achievements have also been covered by a couple of crypto media outlets recently. Going forward we commit to onboard and support new merchants and deliver Dash business integrations as well as replenishing our pipeline with more leads over the course of the next three months. We currently focus on integrating high scale businesses to bring Dash acceptance to a more meaningful level quickly. We are also expanding our importers reach. We will be reaching out to more importers to use Dash and subsequently will venture into remittances. We will keep following our low cost user adoption strategy, merchant support activities and will strengthen our connections into media while we set up our organisation for scaling throughout the next bull market. Dash launched on yellowcard.io (we have also convinced them to drop LTC, BCH and ETH). Dash integrated into bitfxt.com exchange. Dash integrated into quidax.com exchange. Dash payments enabled for 2 car importers, saving them cross border fees. 84 new merchants during February and March. Started verifying and extending merchant support to kurepay merchants, about 1,000 merchants outstanding. Continued merchant support, engaging them on a regular basis. Held Dash usage conference, effectively bringing together and growing the Lagos Dash ecosystem. Organized 8 low cost Dash meetups, teaching users to acquire and use Dash. #EndBankingFraud twitter campaign, 9,050 impressions, 820 engagements. (#EndBankingFraud is a Dash independent growing social movement against current bank practices in Nigeria). 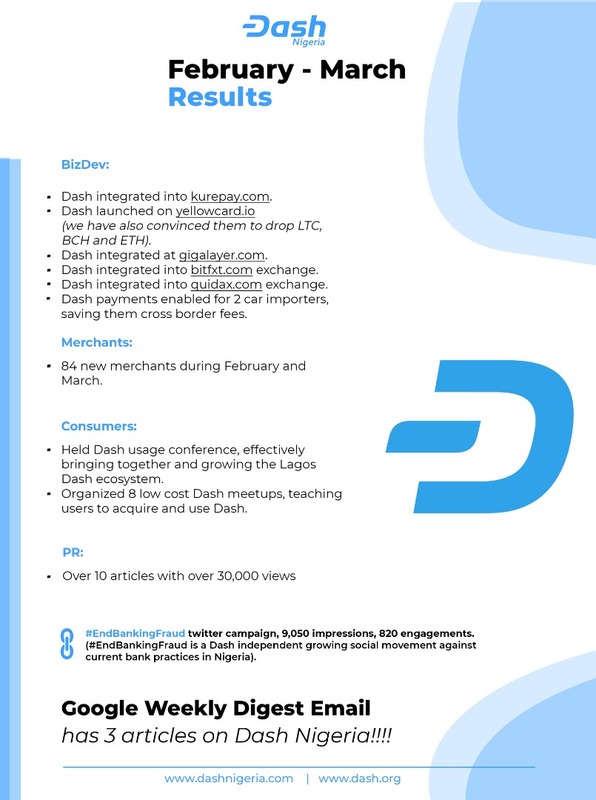 Over the next 3 months we will enable and support Dash acceptance at several new merchants and financial infrastructure/high value companies, build out our media contacts and social media activities. We will also continue our low cost consumer adoption strategy. We will facilitate 6 Business Integrations and sign-up 120 merchants. The essential problem to solve for large scale Dash adoption is this: Big chains need seamless Dash POS and payments services integrations, while payments companies first need a solid exchange infrastructure. Over the last couple of months we have integrated many exchanges so we can now branch out to POS integrations. We have already integrated Dash into kurepay and can now approach their merchants. Over the duration of this proposal we’ll put emphasis on more POS and payment service Dash integrations and are already talking to potential partners in the field. There’s no legal clarity around cryptocurrency in Nigeria, but we’re confident that we can nevertheless convince some new payments partners to enable Dash on their platforms. We have been executing the proposed strategy already successfully for a couple of months. We have been able to constantly increase all relevant metrics: Integrations, merchants, users, transactions and have recently branched out into engaging media partners. We’re constantly among the cheapest teams in the category “General Dash adoption”. We therefore believe to have generated a high return on investment for the DAO. We don’t promise the pie in the sky. We are not required to work through endless lists of requirements before we finally release something. We don’t expect you to pay us many months in advance. We work step by step, unlocking new Dash adoption on the way. Contract us and continue to see ongoing results month over month. Campaigns like #EndBankingFraud prove that Nigeria’s financial infrastructure is ripe for disruption. When we approach Nigerian consumers and merchants with Dash we are met with excitement about all the new possibilities Dash offers them. We’re introducing reliable payments, free “banking” infrastructure and economic cross border payments, capabilities that many Nigerians are experiencing for the first time and are reaping the corresponding strong results. Thank you for your interest in our proposal. Please check out the discord channel where I’ve already addressed your concerns in great detail. I'm voting a solid 'Yes' once again. I can't be the only one to have noticed the solid stream of good news, business integrations, conferences and other signs of adoption we've seen on dashpay over the last couple of months. Its important to keep supporting those teams that are working hard to spread awareness and adoption of Dash. Because Dash is the most technically advanced POW chain with instantSend, privateSend and governance all neatly wrapped into one, new converts into Dash also happen to be far ahead of new converts to other coins. They not only have access to the latest technology in POW blockchains, but they have access to a battlehardened community that is very knowledgeable about topics involving the subject. This means that we should have a very high retention rate from new converts. The speed, decentralized services and teams like DashHelp that we can uniquely afford to fund gives us a decisive advantage when it comes to troubleshooting, which is a big help for people not used to cryptocurrencies! This advantage won't last forever, so we have to strike while the iron is white hot which is right now. So vote YES! for Nathaniel and Dash Nigeria so that we can continue to grow our already burgeoning community in Africa and around the globe. It's reassuring to know about how much our activities mean to the community. Good Luck Nate with your proposal, So i am very surprised to see how Nigeria grow so fast and the add of your merchants into Discover Dash. Thanks mate. Let's get out regions Dashy! !